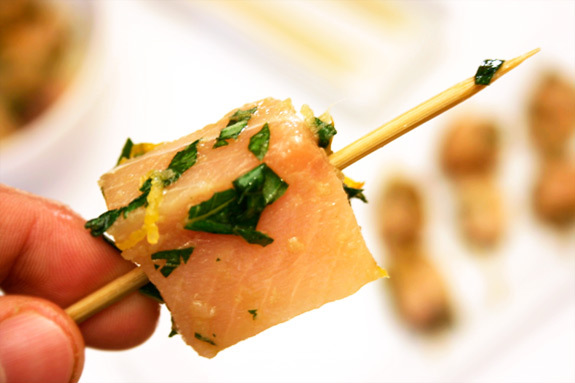 Posted in appetizers, Italian, recipe, savory by Antonio Tahhan on August 20th, 2008. You can follow any responses to this entry through the RSS 2.0 feed. You can leave a response, or trackback from your own site. I had one of the skewers at room temp. for breakfast and it was delicious! Def. held me over until my croissant at the Dupont farmer’s market! Words cannot even begin to describe how hungry I am now! Hey Tony, its my first time here! You have such a lovely blog here! That looks delicious! 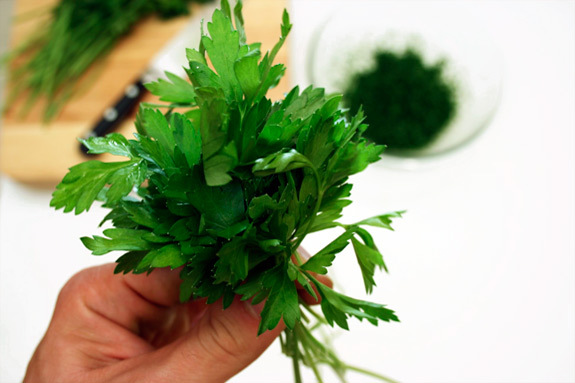 Tabbouleh is one of my favorite med dishes especially when it’s not overpowered by a ton of the bulgar wheat. My husband doesn’t share my obsession with Mediterranean food so we don’t have it enough. I suppose I’ll just have to make it on my own – these are great recipes! Tony, this looks spectacular. Swordfish is a lovely fish and so versatile – but best when grilled. Perfect Tony! This looks delish Tony! I love swordfish! Great looking pictures! 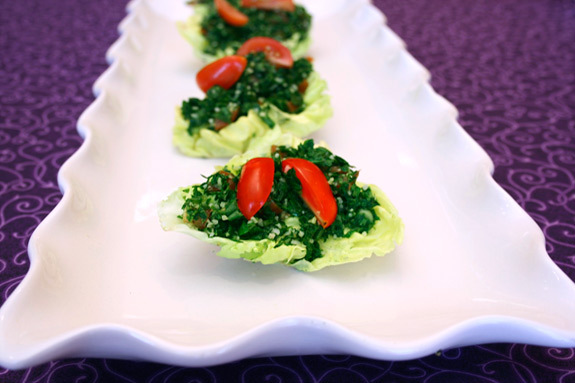 I like idea of serving the tabbouleh in lettuce leaves. Hi Tony, I’m glad I discovered your blog because we share the same passion for Mediterranean cuisine. Can’t wait to see what you are going to come up with. I’ll be following you. ahhh. ur soo cute. thanks for the the entire comment in Spanish! I had no idea you were that fluent! We do make great food don’t we!!?! As for the caja china, I STILL don’t eat pork so I have no real need for one, though I would like to own eventually when I have a house big enough to store it in…we’ve made one at my parents’ house which was a traumatic experience for me! lol! it’s such a Cuban thing to do! Thanks for watching the epi. E is great but of course he made me look like he’s teaching ME how to make Cuban food!?!?! Go figure! This looks wonderful. I love all things med. And such beautiful presentation! 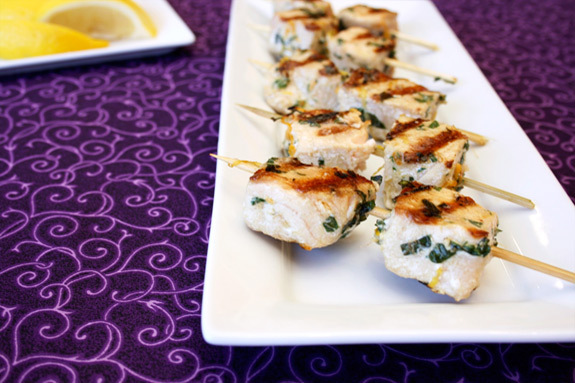 The fish spedini ( we just call’em kebabs :p)looks gr8 ! swordfish is a beautiful fish to grill due to is chuncy white flesh, holds shape n doesnt break down. I can almost imagine all those lovely zesty flavours in there. 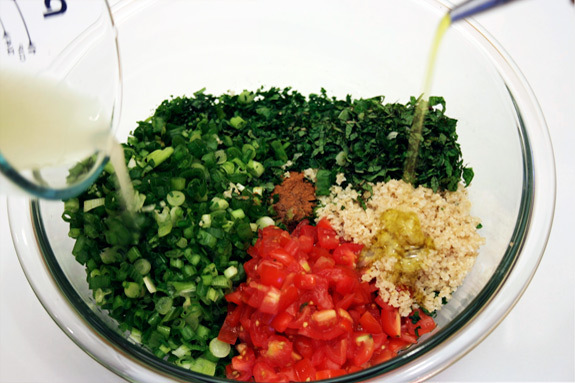 When i make tabbouleh, even i put far more veggies n herbs that the grain itself. Another thank-you for not overpowering the tabbouleh with too much bulgur! This spread looks amazing! What a fun party menu! Raquel: I can’t believe that was last week… let’s go again today? 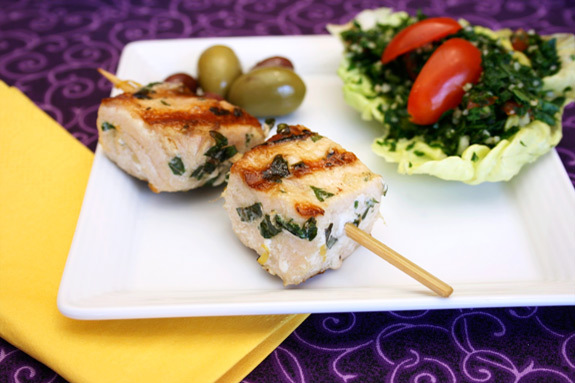 Christina: If only swordfish and Tabbouleh would fedex more easily…. Poonam: Thanks for stopping by! Maggie: Thanks! 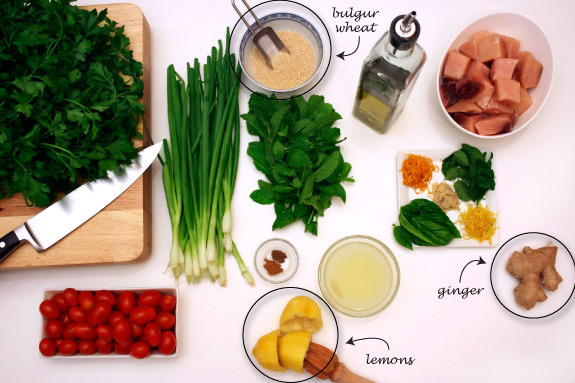 It’s traditional to serve this salad with huge hearts of Romaine…. I chose tiny ones because they’re easier to eat and they look better, too. Hélène: Awesome! Welcome and I can’t wait to check out your blog as well! Bren: haha, I was born in Venezuela 🙂 I’ll have to feature falafel soon, it’s also one of my faves! Wow – I’ve never been here before, came over out of curiosity about the DB hosts. You have some of the best food photography I’ve ever seen! Brilliant! I absolutely love this entry – exactly my kind of flavours!